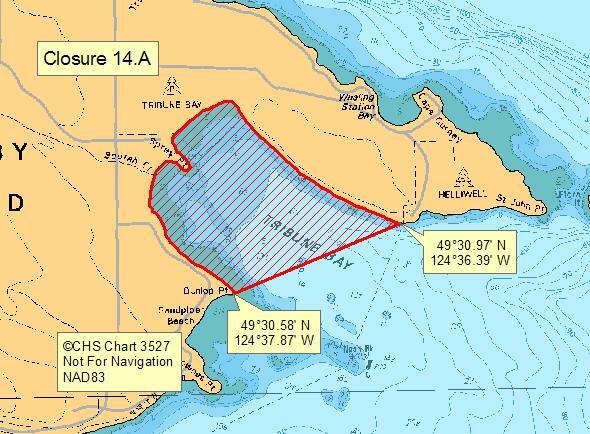 Always check marine biotoxin and sanitary contamination closures for the area where you are harvesting. 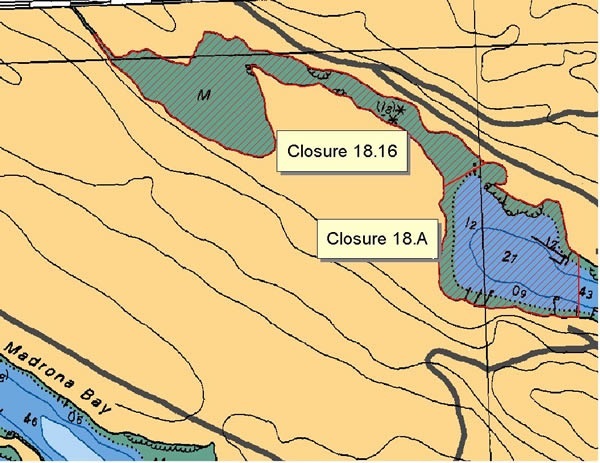 Closures change frequently throughout the year. 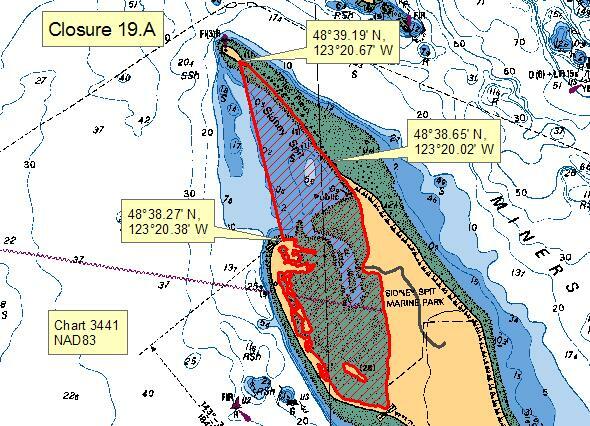 It is illegal to harvest shellfish from closed or contaminated areas. 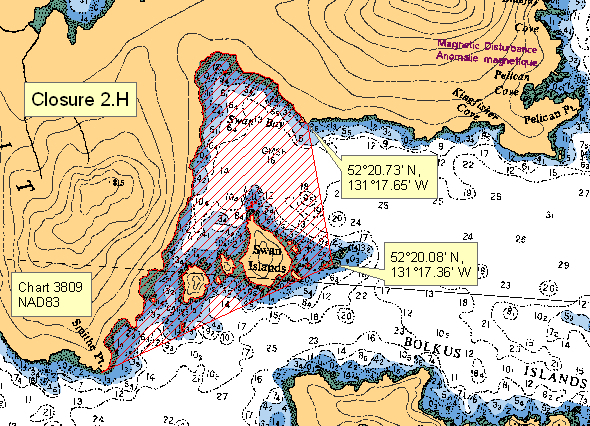 Make sure your buoy line doesn’t float and become tangled in boaters’ props. 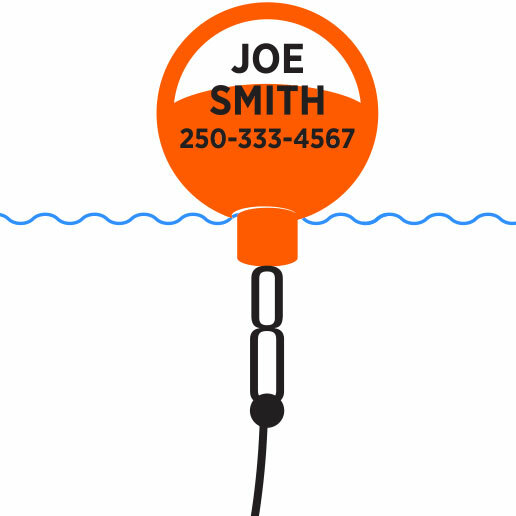 Either use sinking line or, if you use floating line, attach a weight to keep the extra line under the water at all tide levels (without sinking the buoy). Single trap 1 floating tag or buoy that has your name on it. 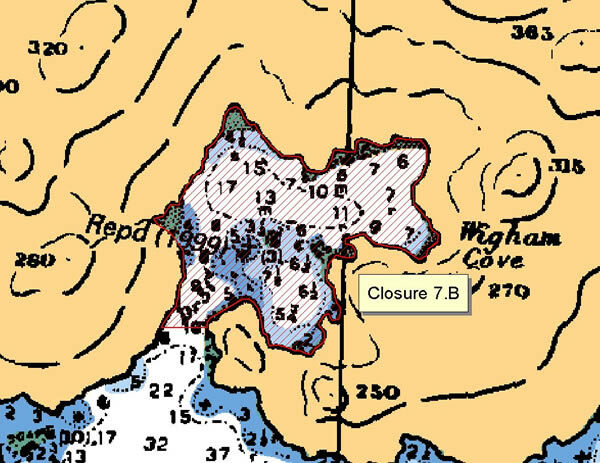 Two traps Single ground line marked with 1 floating tag or buoy that has your name on it. Note: Max. 2 traps for crab harvesting Single ground line. 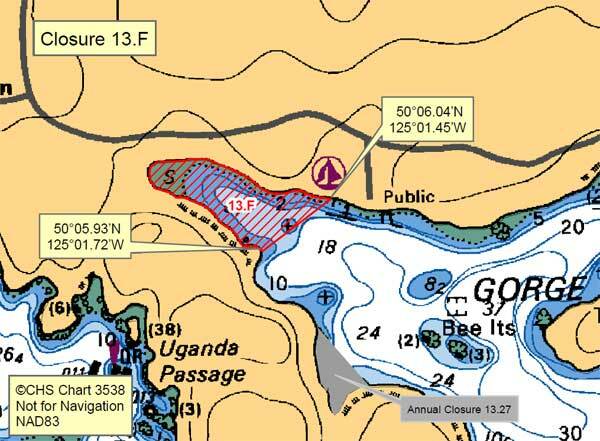 Both ends of the ground line require a floating tag or buoy that has your name on it. 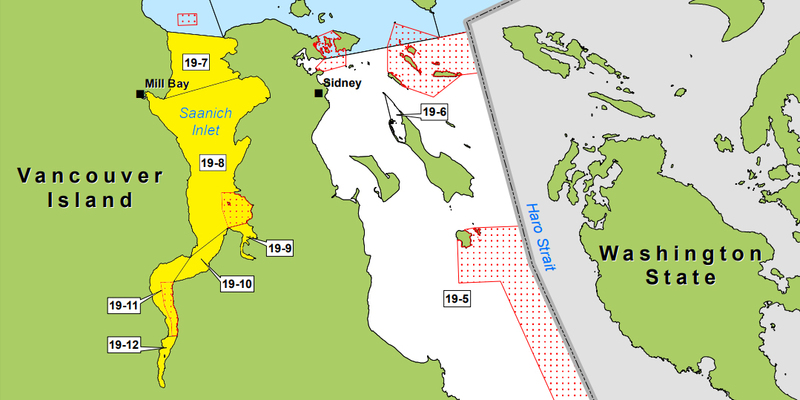 The maximum number of shrimp and prawn traps you can fish is 4 (4 traps or 4 ring nets, or a combination of these). 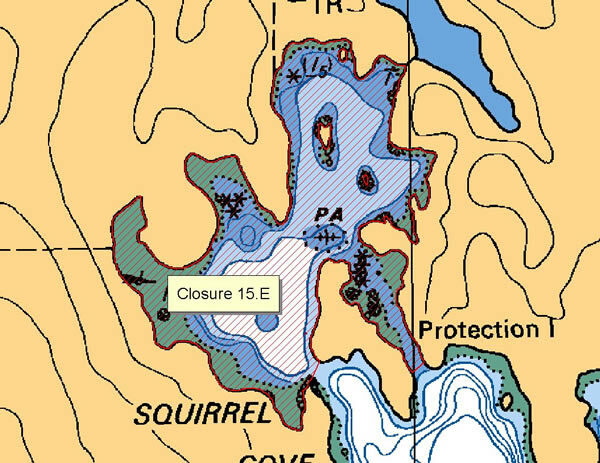 Check all your gear carefully and remove and release all bycatch. You must release incidental catch alive, to the place where you caught it, in a way that causes the least harm to the fish. Never hang your shellfish catch off a dock or over the side of a boat when travelling as the water could contaminate your catch. 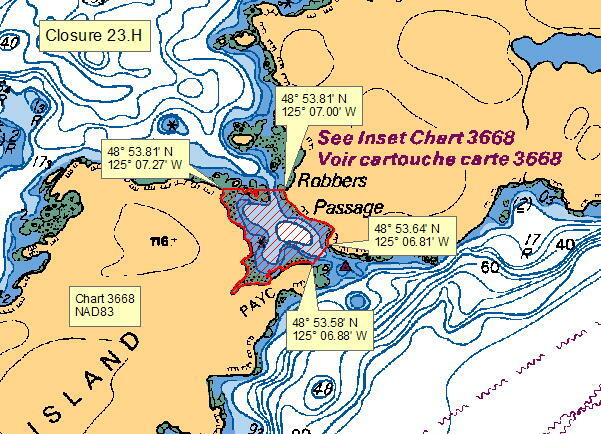 Learn about handling crab catch. For conservation purposes, fishers must release prawns carrying eggs under their tail (egg-bearing females). Do not hang your bivalve shellfish off docks, or off the side of a vessel where travelling, as the waters you are in could be contaminated. 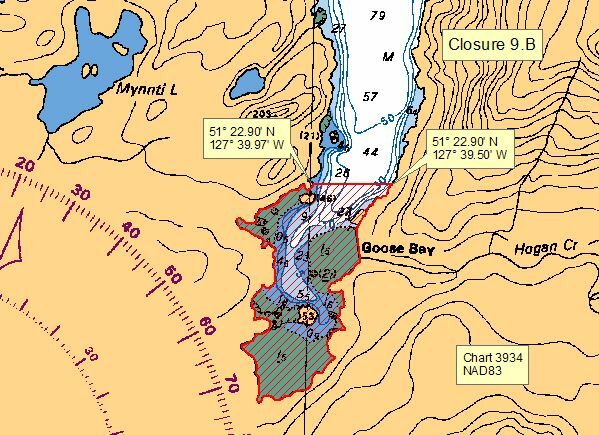 Always check the area you intend to fish for regulations and restrictions before you head out. 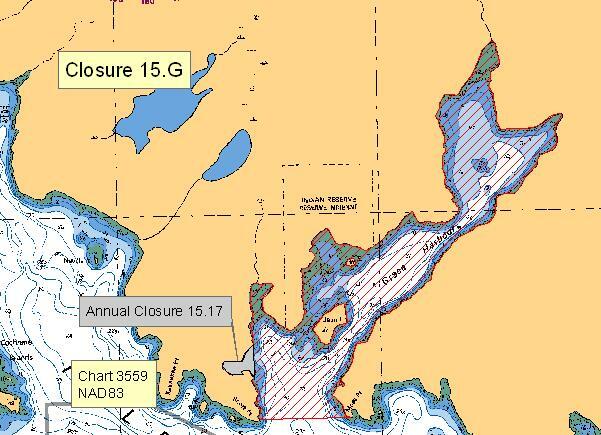 Forecast closure dates are subject to change and may not reflect current regulations. Decisions are made in season. In the spring and fall we take samples to make sure there are enough spawning females in the water. 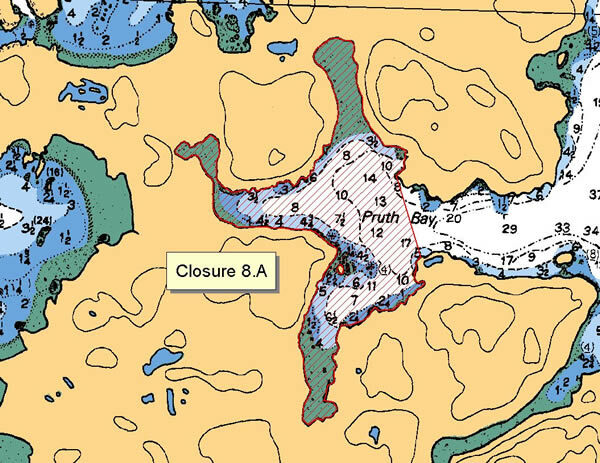 Decisions about fishing closures are made based on the results of this sampling. Reminder: fishers must always release prawns carrying eggs under their tail (egg-bearing females). Subscribe to the fishery notice system and we’ll send updates to your inbox. 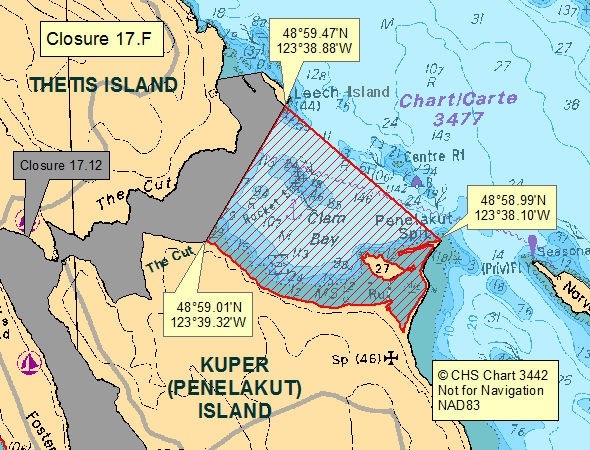 Stuart Channel, Saanich Inlet and Alberni Inlet begin "pulse fishing" (closed in the first half of the month and open in the second half of the month) the first day after Labour Day. 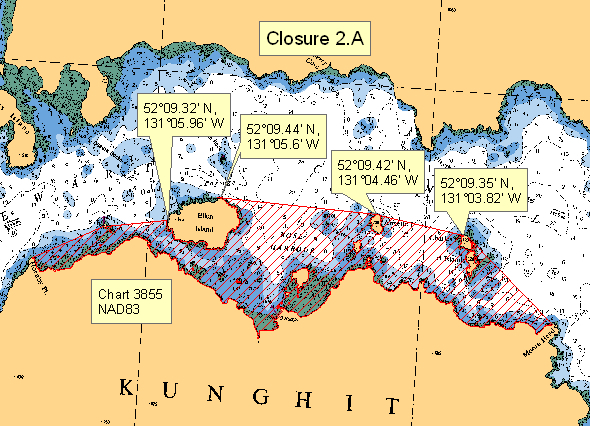 Read our Q&A on prawn and shrimp pulse fishing for more information. Depending on the results of the spawner index testing in the fall, we close the following areas from January 1 - March 31 and re-open them on April 1. These 3 month winter closures protect large, mature egg-bearing females as their eggs prepare to hatch. 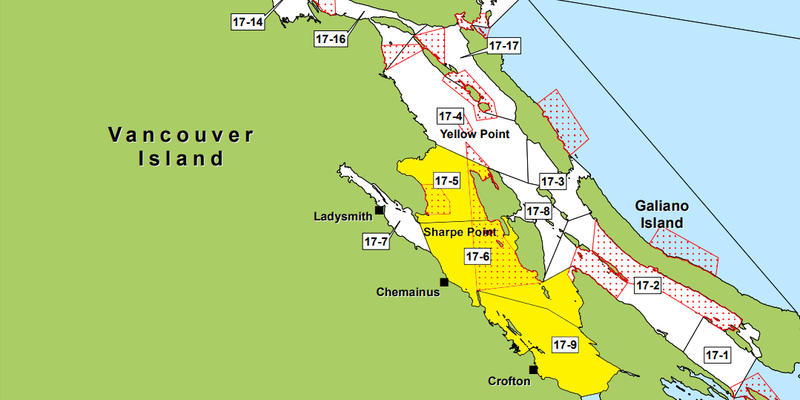 Parts of Stuart Channel, Alberni Inlet and Saanich Inlet may continue "pulse fishing" (closed in the first half of the month and open in the second half of the month. Read our Q&A on prawn and shrimp pulse fishing for more information. Bivalve shellfish are filter feeders that can gather and store contaminants from pollution sources including from naturally occurring marine biotoxins. 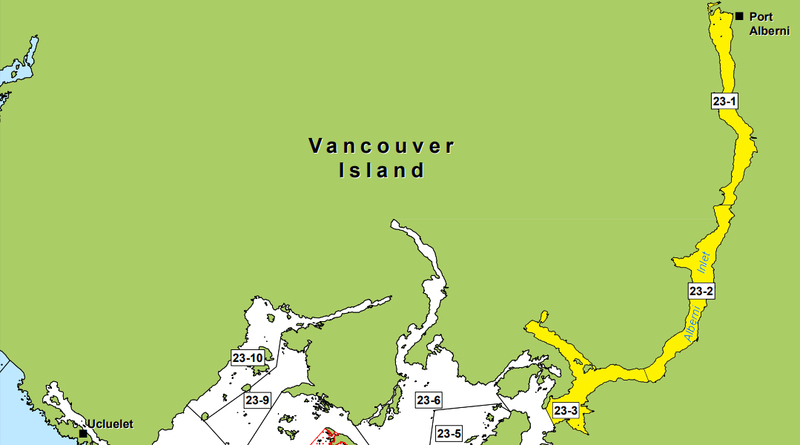 It is illegal and unsafe to harvest any species of bivalve shellfish in the below areas during the closed periods. 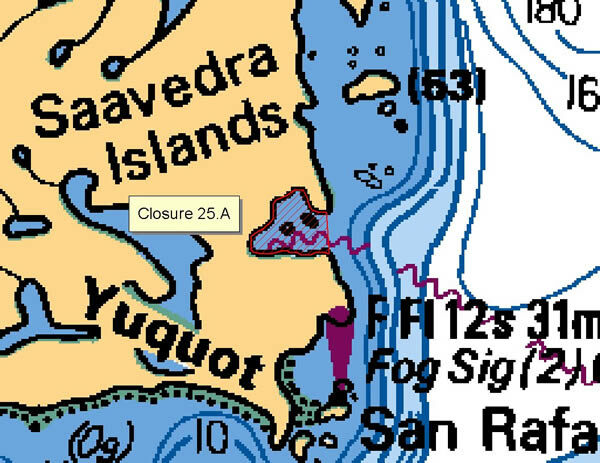 You can find bivalve shellfish harvest opportunities and closures for recreational fishers on our Sport Fishing Guide. Remember to also check for contamination closures. 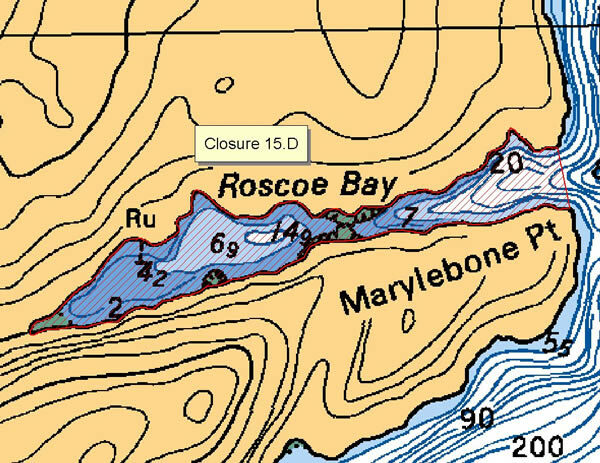 Map: Closure 02.C The waters and intertidal foreshore of an unnamed bay on Moresby Island lying inside a line drawn from Point Langford westerly to Forsyth Point. 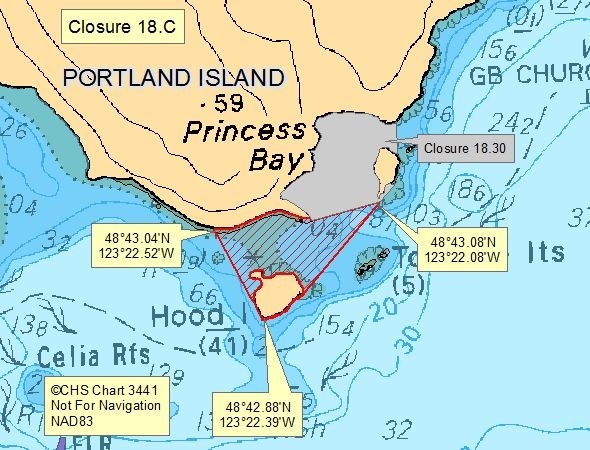 Map: Closure 05.A The waters and intertidal foreshore of Grenville Channel bounded on the northwest by a line from Ormiston Point on Pitt Island, thence true east to the mainland at 53° 34.25' north latitude and 129° 38.90' west longitude; and bounded on the southeast by a line from Sainty Point on the mainland to Yolk Point on Farrant Island at 53° 21.83' north latitude and 129° 20.00' west longitude; and bounded on the southwest by a line across the entrance to Union Passage from the northernmost point of land on Farrant Island at 53° 24.68' north latitude and 129° 24.90' west longitude, thence northwesterly to a point on Pitt Island at 53° 24.82' north latitude and 129° 25.05' west longitude (NAD 27). 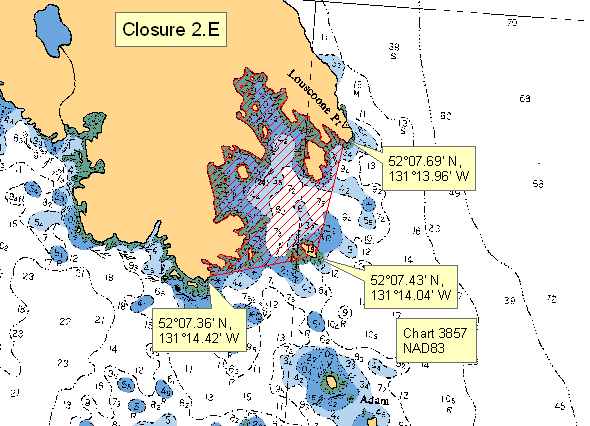 Map: Closure 08.A The waters and intertidal foreshore of Pruth Bay, Calvert Island, inside a line drawn from the headland at 51°39.41' north latitude and 128°06.71' west longitude, thence southeast to the headland on the opposite side at 51°39.12' north latitude and 128°06.54' west longitude (NAD 27). 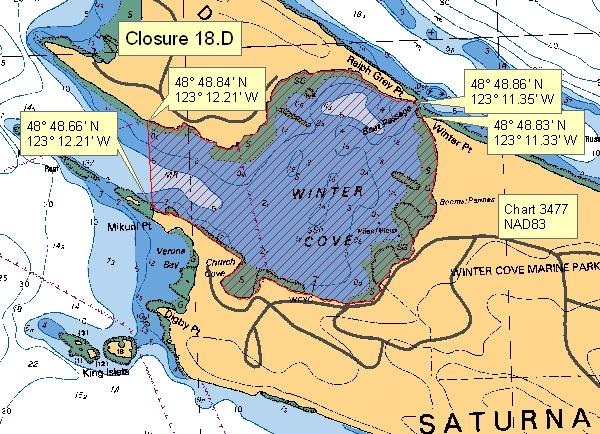 Map: Closure 10.A The waters and intertidal foreshore of Millbrook Cove, Smith Sound, lying inside a line drawn from the headland at the western end of the cove entrance at 51°19.30' north latitude and 127°44.18' west longitude, thence east to the headland on the eastern end of the cove entrance at 51°19.34' north latitude and 127°43.71' west longitude [NAD 83]. 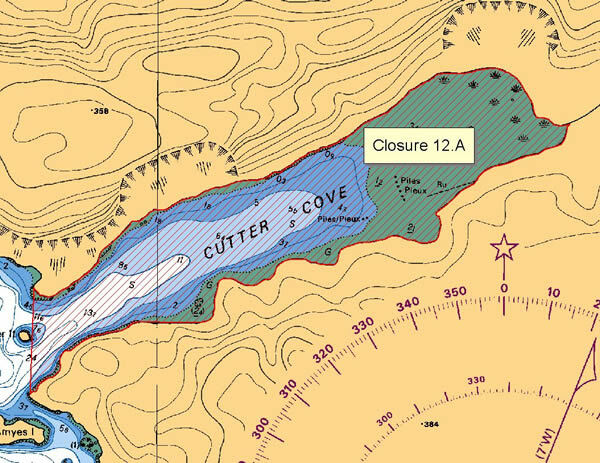 Map: Closure 12.A The waters and intertidal foreshore of Cutter Cove lying east of a line drawn from the southern headland of the cove, thence northerly to the westernmost point on the northern headland. 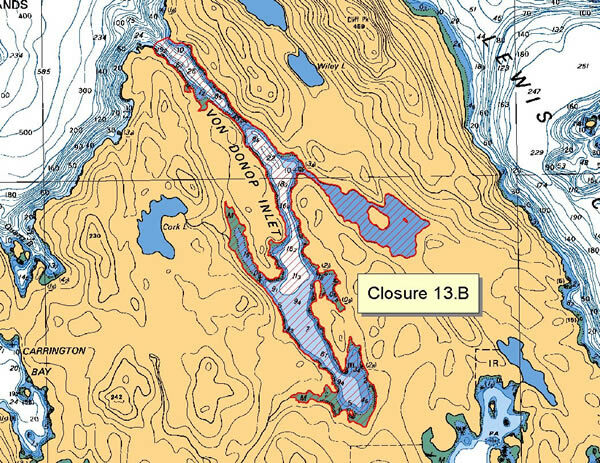 Map: Closure 13.B The waters and intertidal foreshore of Von Donop Inlet, Cortes Island. 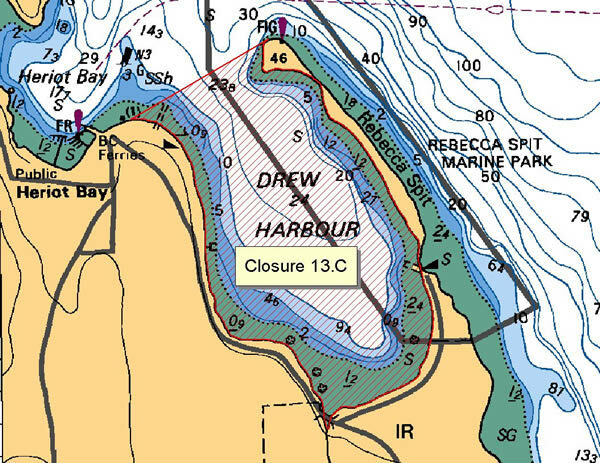 Map: Closure 13.C The waters and intertidal foreshore of Drew Harbour, Quadra Island, lying inside a straight line drawn from the northernmost tip of Rebecca Spit across the entrance of Drew Harbour to its western headland. 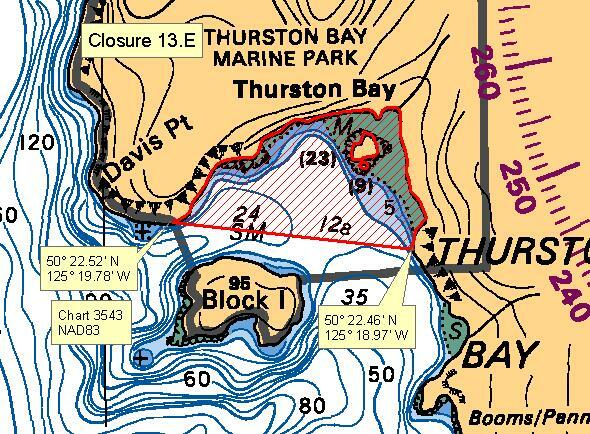 Map: Closure 13.E The waters and intertidal foreshore of the northern portion of Thurston Bay, Sonora Island, north of a line drawn from Davis Point at 50°22.52’ north latitude and 125°19.78’ west longitude, thence in an easterly direction to a point of land at 50° 22.46’ north latitude and 125° 18.97’ west longitude (NAD83). 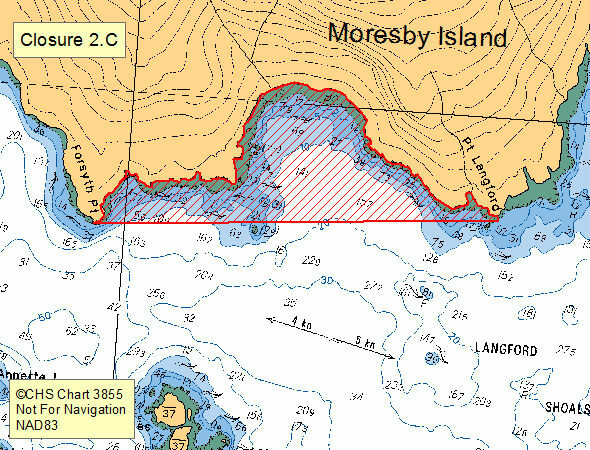 Map: Closure 14.A The waters and intertidal foreshore of Tribune Bay, Hornby Island, lying inside of a line from Dunlop Point on the southwest shore at 49°30.58’ north latitude and 124°37.87’ west longitude thence northeasterly to a point on land at 49°30.97’ north latitude and 124°36.39’ west longitude. [NAD 83]. 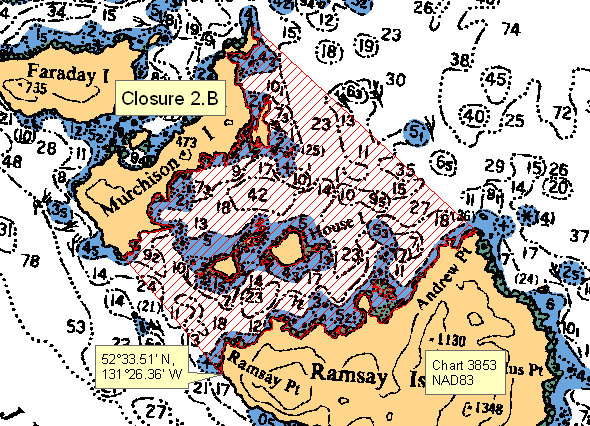 Map: Closure 15.A The waters and intertidal foreshore of the area known as Prideaux Haven, including Melanie Cove and Laura Cove, bounded on the west by a line drawn along the shortest distance from Eveleigh Island to the shore of the mainland and on the north by a line drawn from Lucy Point on Eveleigh Island to the westernmost tip of Scobell Island and thence from the easternmost tip of Scobell Island to Copplestone Point. 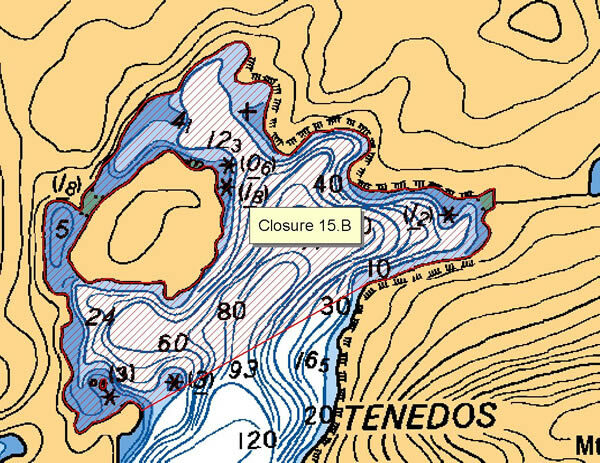 Map: Closure 15.B The waters and intertidal foreshore of Tenedos Bay lying inside a line drawn from the eastern tip of Bold Head northeast to the southern headland of the easternmost bay of Tenedos Bay. 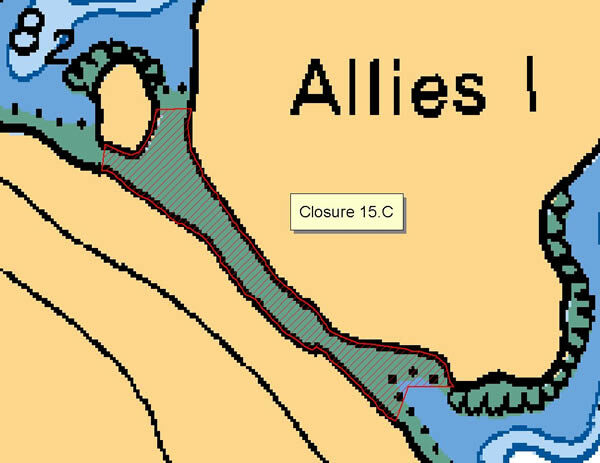 Map: Closure 15.C The waters and intertidal foreshore lying between Allies Island and west Redonda Island. 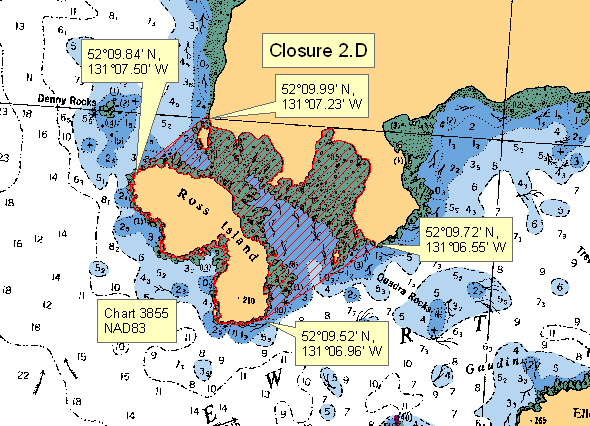 Map: Closure 15.D The waters and intertidal foreshore of Roscoe Bay, west Redonda Island. 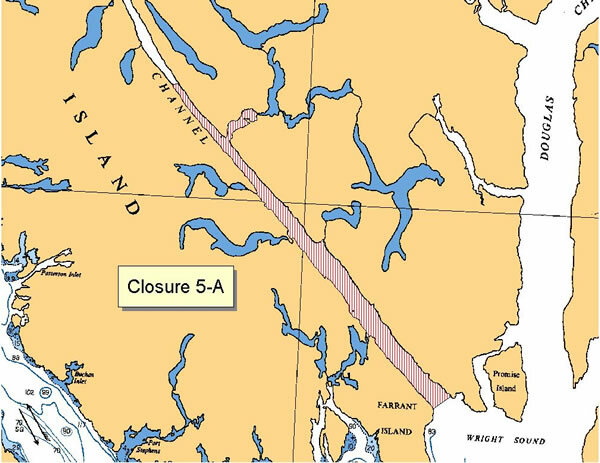 Map: Closure 15.E The waters and intertidal foreshore of Squirrel Cove, Cortes Island, lying inside a line drawn along the shortest distance from the western shore of Protection Island to Cortes Island and inside a line drawn along the shortest distance from the eastern shore of Protection Island to Cortes Island. 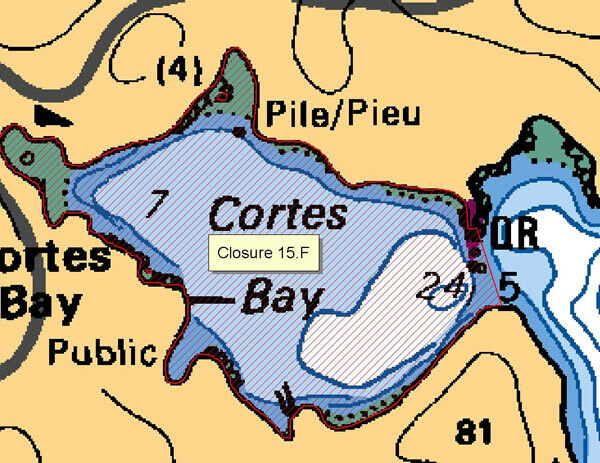 Map: Closure 15.F The waters and intertidal foreshore of Cortes Bay, Cortes Island, lying inside a line drawn across the entrance to the bay. 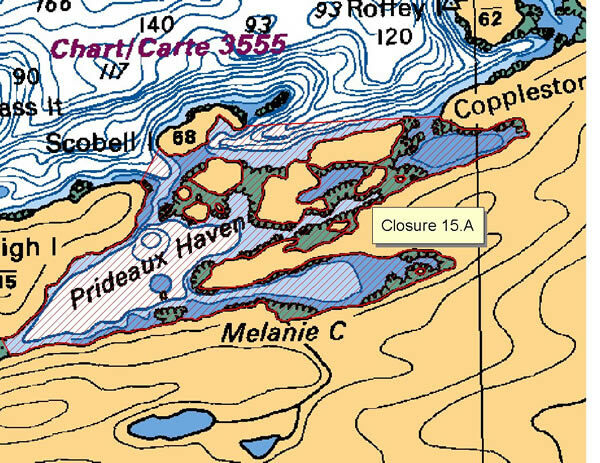 Map: Closure 15.G The waters and intertidal foreshore of Grace Harbour lying inside a line drawn from Moss Point to Scott Point, excluding the annual closure 15.17. 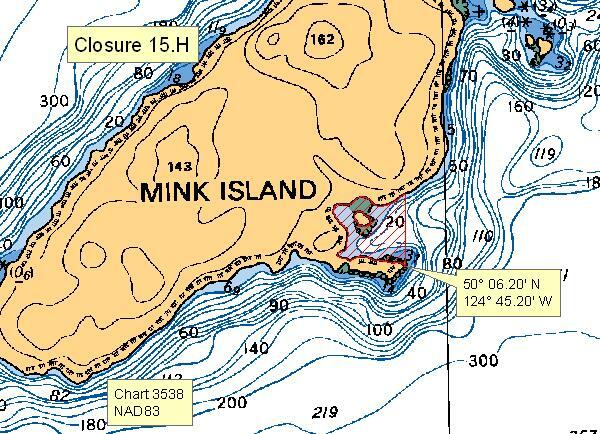 Map: Closure 15.H The waters and intertidal foreshore of the prominent bay on the southeast side of Mink Island, Desolation Sound, lying west of a line drawn true north from the point of land at 50°06.20’ north latitude and 124°45.20’ west longitude. 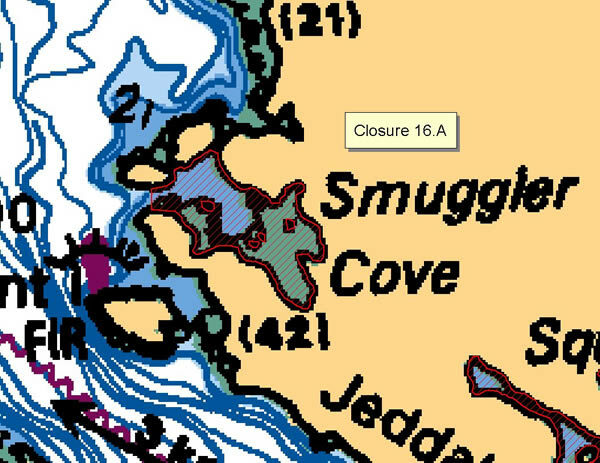 Map: Closure 16.A The waters and intertidal foreshore of Smuggler Cove lying inside a line drawn from the Smuggler Cove Marine Park sign at the entrance to the cove to the opposite shore. 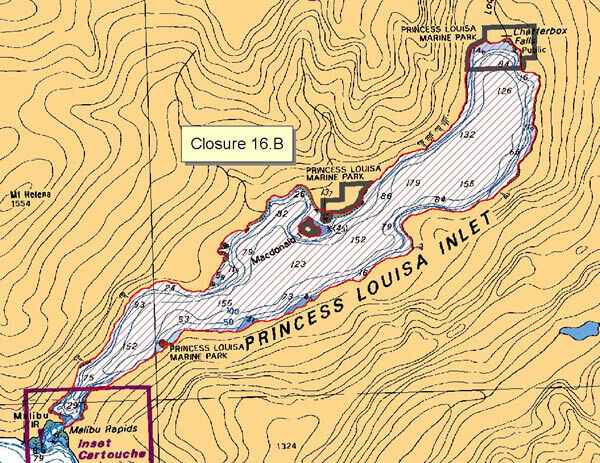 Map: Closure 16.B The waters and intertidal foreshore of Princess Louisa Inlet inside a line drawn across the narrowest point at Malibu Rapids. 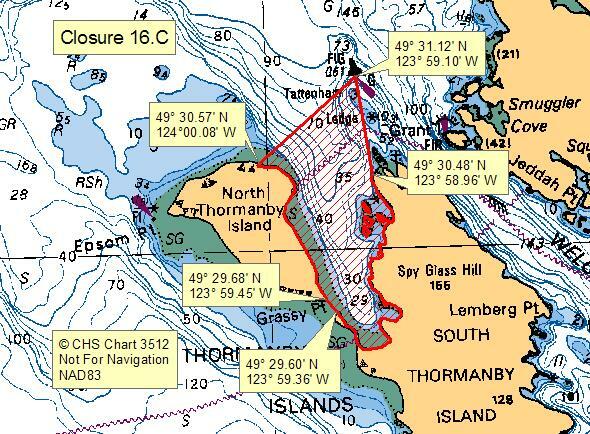 Map: Closure 16.C The waters and intertidal foreshore of Buccaneer Bay, Thormanby Islands, south of a line drawn from the westernmost unnamed point west of Derby Point on South Thormanby Island at 49°30.48’ north latitude and 123°58.96’ west longitude, thence northerly to the green lateral buoy designated Q51, located at or near 49°31.12’ north latitude and 123°59.10’ west longitude, thence southwesterly to a point on land at the edge of the beach at the base of the cliff on North Thormanby Island at 49°30.57’ north latitude and 124°00.08’ west longitude; and northeast of a line drawn from Grassy Point, North Thormanby Island at 49°29.68’ north latitude and 123°59.45’ west longitude, thence southeasterly to the nearest point of land on South Thormanby Island at 49°29.60’ north latitude and 123°59.36’ west longitude. 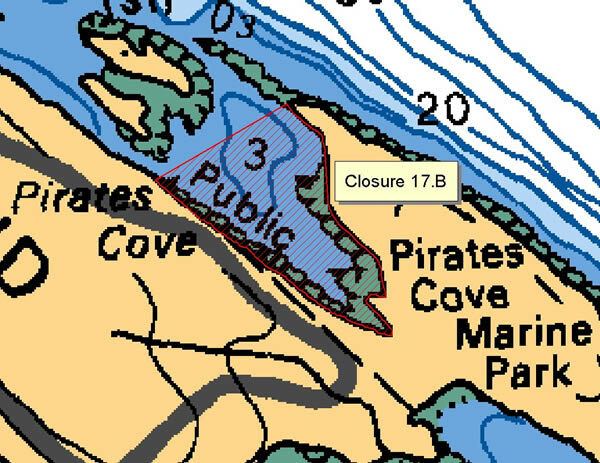 Map: Closure 17.B The waters and intertidal foreshore of Pirates Cove, De Courcy Island. 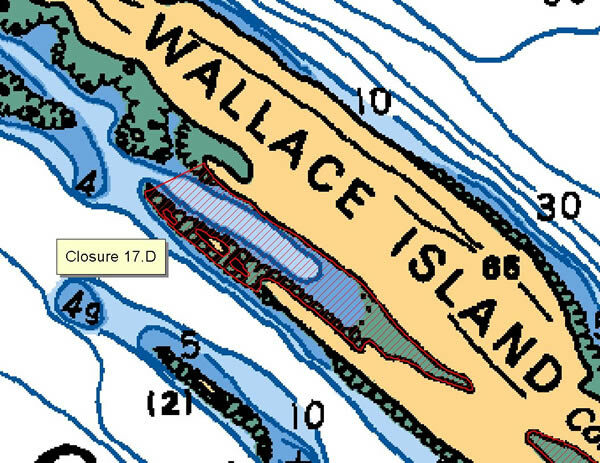 Map: Closure 17.D The waters and intertidal foreshore of the cove northwest of Conover Cove, Wallace Island, lying inside a line drawn from the northwesternmost point of the shoal at 48°56.65' north latitude and 123°33.40' west longitude, thence northeasterly to the end of the headland on the opposite shore [NAD 27]. 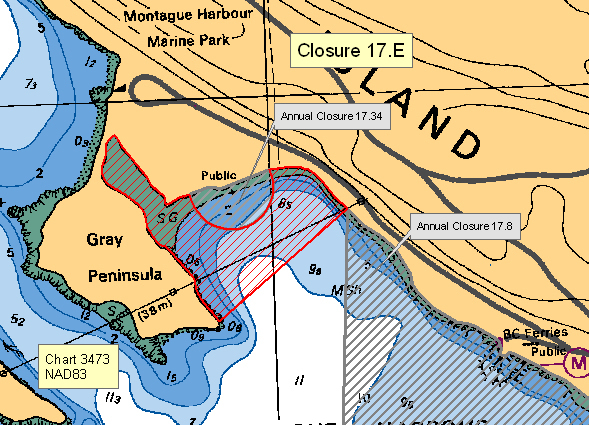 Map: Closure 17.E The waters and intertidal foreshore of Montague Harbour, Galiano Island, inside a line drawn from the southeastern tip of Gray Peninsula northeasterly to the base of the overhead cable tower on the northeastern foreshore of the harbour. 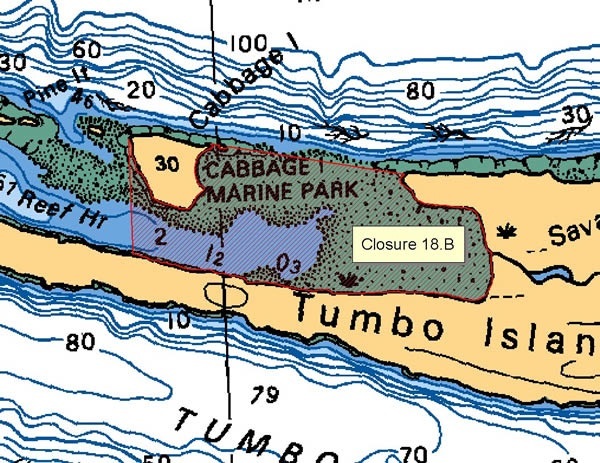 Map: Closure 18.B The waters and intertidal foreshore of Reef Harbour, lying inside a line drawn from the northeastern tip of Tumbo Island at 48°47.90' north latitude and 123°04.45' west longitude to Cabbage Island thence along the northern shoreline of Cabbage Island to a point at 48°48.00' north latitude and 123°05.25' west longitude, and thence southward to a point on Tumbo Island at 48°47.75' north latitude and 123°05.25' west longitude [NAD 27]. 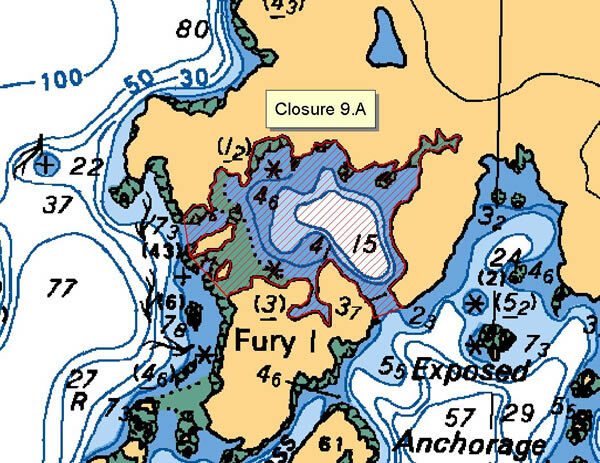 Map: Closure 19.A Those waters inside a line, representing DFO statistical subarea 19-6, that begins at the end of Sidney Spit at 48° 39.19' north latitude and 123°20.67' west longitude, thence in a southeasterly direction to a point of land on Sidney Island at 48°38.65' north latitude and 123°20.02' west longitude, thence following the shoreline of Sidney Spit Marine Park on Sidney Island to a point on land at 48°38.27' north latitude and 123°20.38' west longitude, thence northerly to the beginning point (NAD 83). 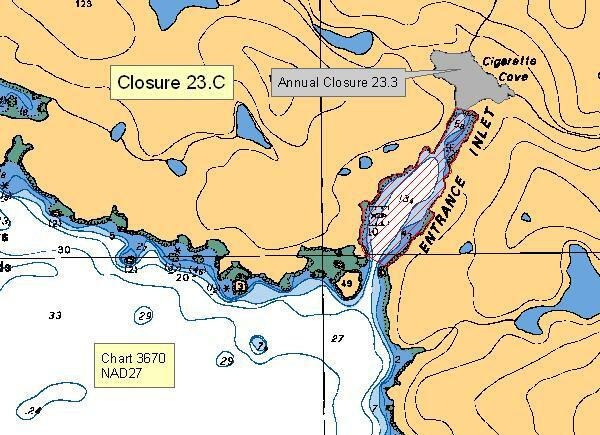 Map: Closure 23.C With the exception of Cigarette Cove at the head of Entrance Inlet, which is closed annually under Sanitary Closure Map 23.3, the waters and intertidal foreshore of Entrance Inlet, lying inside a line drawn across the narrows at the entrance, from a point on land on the west side of the entrance at 49° 00.00' north latitude and 125° 17.78' west longitude, to a point on land on the east side of the entrance at 48° 59.98' north latitude and 125° 17.70' west longitude, thence to the narrows at the boundary on Sanitary Closure Map 23.3, at a line drawn across the narrows from a point on land on the west side at 49° 00.33' north latitude and 125° 17.45' west longitude, to a point on land on the east side at 49° 00.33' north latitude and 125° 17.41' west longitude (NAD 27). 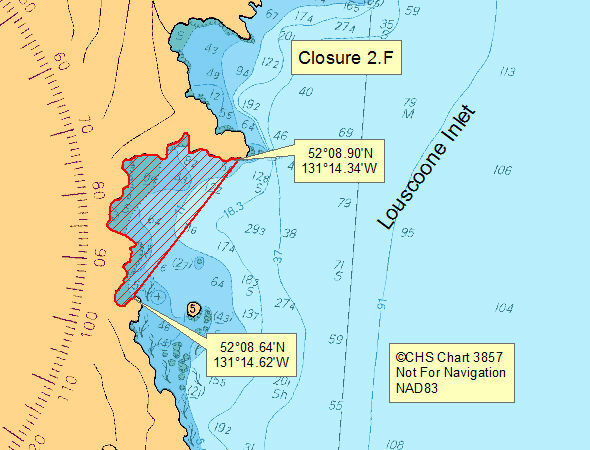 Map: Closure 23.H The waters and intertidal foreshore of Robbers Passage, south of a line drawn from a point of land on Tzartus Island at 48° 53.81' north latitude and 125° 07.00' west longitude due west to a point on land on Fleming Island at 48° 53.81' north latitude and 125° 07.27' west longitude; and north of a line drawn from a point of land on Tzartus Island at 48° 53.64' north latitude and 125° 06.81' west longitude southwesterly to a point of land on Fleming Island at 48° 53.58' north latitude and 125° 06.88' west longitude (NAD83). 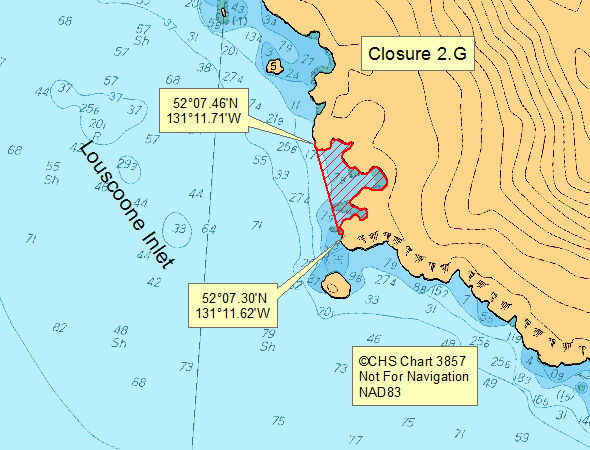 Map: Closure 25.A The waters and intertidal foreshore of Santa Gertrudis Cove, Nootka Island, inside a line drawn from the point at the southern end of the cove entrance at 49°36.23' north latitude and 126°36.85' west longitude to the point on the northern end of the cove entrance at 49°36.10' north latitude and 126°36.90' west longitude [NAD 27]. 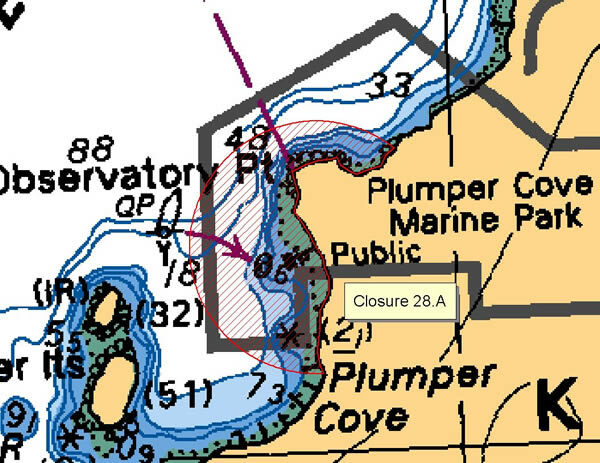 Map: Closure 28.A The intertidal foreshore of Plumper Cove, Keats Island, lying within a 300 m radius of the Provincial Park wharf.